Scotland has many excellent white water rafting rivers, one of the key rivers on the Scottish rafting scene is the River Tummel. White Water Rafting on Scotland’s River Tummel is something special and it serves up its unique adrenaline cocktail every June through to September. The river is dam released. White Water rafting Scotland River Tummel is a full on half day experience. The day starts with a drive along the banks of Loch Faskally which is near Pitlochry. Here our customers are greeted at the Scottish & Southern Energy Power plant postcode ( PH16 5NF ) by our expert guides and management staff. Names are checked off, customers are registered and the day begins. A short safety brief will see you issued with all our industry standard safety equipment as standard. Ie a wetsuit, BA (buoyancy aid), helmet and paddle. After all, you are the engine that will be powering the white water raft down the mighty river Tummel. The first section of the river is always about teamwork, the guide will give a short water safety brief. Here they explain the raft and more, then they will show you how to paddle, how to work as a team and all whilst having fun – this is not some dry classroom – we are here to have fun and our guides love having fun!! But be rest assured, safety is always our top priority!! The River Tummel is like no other whitewater experience in Scotland. The Tummel will get you working together with your fellow team and our guide. You will power the raft from the beautiful deep pools at the beginning down through technical rapids such as ‘Zig-Zag’ and ‘Sharks Tooth’. 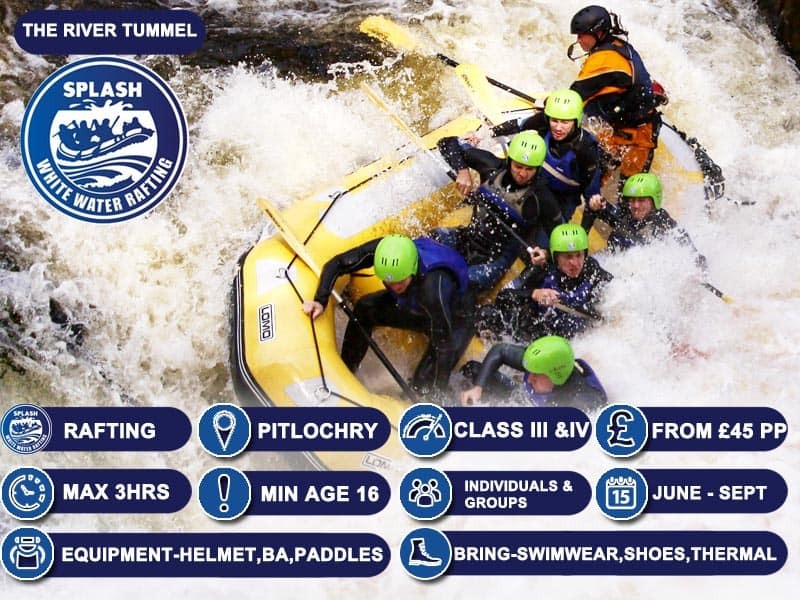 White Water rafting Scotland river Tummel is an excellent day out for anyone aged 16 and over. It is especially popular with Stag dos, hen parties, corporate team building days, birthday parties, charity events, friends on adventure weekends and more. We at Splash white Water Rafting taking bookings from Individuals and groups and all of our White Water Rafting trips come with FREE WHITE WATER RAFTING PHOTOS as standard. So you will have excellent memories to share after the raft trip of a lifetime.